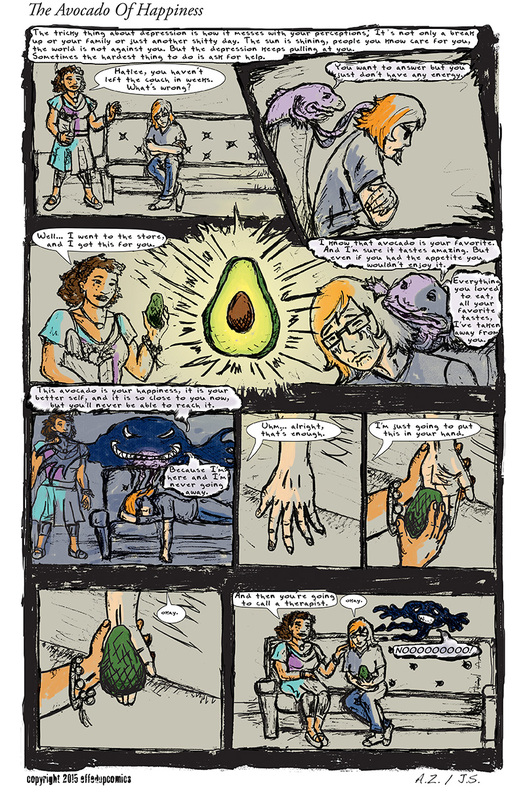 Basically, because Andrea is such a wordsmith, and I didn’t want to drastically cut any of her script, I reconfigured my original layout for this page several times. At one point it was almost twice as long as it is now, and would have been split into two pages for publication. Luckily, after all that work I did on it, cutting and pasting her line work and embellishing where necessary, fitting in as much of her script as I could, exactly at the moment that I typed in the title and copyright info, my laptop crashed and the file became completely irretrievable. Needless to say, it took awhile to recover from that. Then, while trying to add a captcha feature to deter spammers, I updated Comic Press and lost everything else. All the files, comics, everything. Gone. Pretty much gave up for a bit at that point. But I figured I at least owed it to the three of you that read this thing to finish the story, so I went back to Andrea’s line work and started re-cutting, re-editing, re-embellishing. It’s not quite what we wanted originally, but it works. Where do we go from here? I have two more comics and Sarah has three I think. No telling when exactly those will be posted. After that we may take another quick break and regroup.